Take tram 16 or 17 (nightline N17) from Hauptbahnhof/main station (direction Amalienburgstr.) to Romanplatz, change to the bus 17 (direction Amalienburgstr.) for about 5 minutes to the stop Botanischer Garten, turn right into Franz-Schrank-Strasse (altogether around 15 mins). The Tram runs every 10 minutes during the day, every 20 minutes in the evenings. It is also a nightline (N17)! 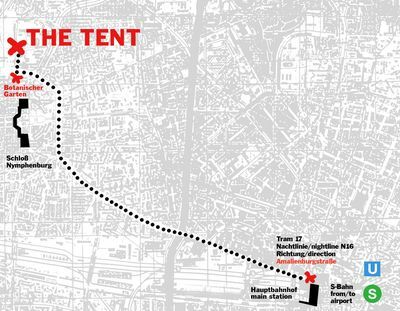 THE TENT is open day and night and accessible by public transport 24h.